Why Buy a 24-inch Pro Solution When a Pro 44-inch Dye Sub System Costs Less? Imagine a Pro 24-inch System Costing More than a 44-inch Dye Sub System! Thinking of upgrading from a desktop dye sub system or starting with a new dye sub system? As you ponder this question we are sure one of the questions will be whether to migrate to the next size up such as a 24-inch system, or go to a full 44-inch system? Our answer, as you will note below is, go for the 44-inch system. It makes sense financially for both short and long term...and is lower cost. And, the 44-inch offers far more capabilities and opportunities to make money as compared to the 24-inch system. By the way, did we mention the 44-inch system costs less! What does a 24-inch or 44-inch system include? It includes the following components. The full outline of a 24-inch system from Conde and a 44-inch system from Graphics One is outlined in the following chart. It is important to note that in the end a user will pay less for the 44-inch system than for the 24-inch system. It's a fact. Special Price of $12,263 plus cost of stand $299, Ink $880 and Take-up $695. You might ask what are the differences between the two offerings? Yes, there are differences. In the 44-inch system offered by Graphics One, the RJ-900X is 83% larger than the 24-inch Virtuoso VJ 628 dye sub printer. Another huge difference is that the system offered by Graphics One includes the Metalnox EL 900 Heat Press whereas the Conde system offers the Geo Knight DK32 Heat Press. The EL 900 is a much larger press and offers 42% more transfer space than the DK32. The DK32 is a very limiting heat press in size and will substantially limit the sizes. The EL 900 is the perfect size for the 44-inch Mutoh printer. If you would like to read a comparison between the Geo Knight DK32 and the Metalnox EL 900 please go to: Knight DK32 vs Metalnox EL 900 Heat Presses. Would you like to add on more savings? Can you imagine saving enough money using GO NeoTack instead of Sawgrass Dye Sub ink? We can show you how you can save over $9,000 with the purchase of GO NeoTack Dye Sub ink rather than Sawgrass Dye Sub Ink. Please read here Using GO NeoTack Saves Over $9,000. Full 44-inch System From Graphics One--More Costs Less! 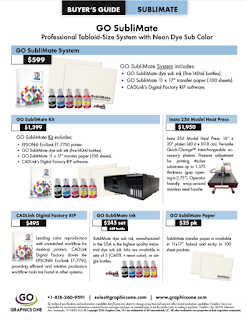 For added information on the complete GO 44-inch dye sublimation system, please go to: 44-inch Dye Sub Printer / Heat Press System.